How to use JR West Kansai Area Pass. Compare pass and single fare. How to access to Shirakawago from Takayama, Kanazawa, Takaoka and Toyama. Which one is better, Shinkansen (left) or Kintetsu (right) ? If you have to move between Nagoya and Osaka (or Kyoto), you have two choices, Shinkansen or Kintetsu railway. I would like to compare these two choices and tell you pros and cons of each choice. 7 days JR Pass price is almost same as round trip fare between Tokyo and Osaka by Shinkansen. That means if you have one way trip from Tokyo to Osaka or reverse, JR Pass is not worthwhile using. However if you add some trips when you stay in Osaka and Tokyo, you may use JR pass 7 days. Shinkansen is the high speed train service in Japan. Kodama is the slowest train on Tokaido-Sanyo Shinkansen line. When you move among Tokyo, Nagoya, Kyoto and Shin-Osaka, you may think to take Shinkansen (a.k.a. bullet train). If you have round trip between Tokyo and Kyoto/Shin-Osaka, JR pass is the best choice. But even 7 days JR pass price is almost equal to round trip fare and seat fee of Shinkansen between Tokyo and Shin-Osaka. JR pass is not the best choice for one way movement. This is a collaboration of Shinkansen and very popular Japanese Anime “New Generation Evangelion (link to Wikipedia)” as Sanyo Shinkansen 40 years anniversary special project. This unique Shinkansen fleet has very different exterior that is painted by Evangelion color. And also it has Evangerion exhibition in car #1. There are many more Evangerion characters and designs in the trains. If you know this anime, you must be excited. Even if you are not familiar with this anime, you will be impressed by these decorations. If you arrive in Kansai airport, most of you go to Osaka, Kyoto, Kobe or maybe Nara, Wakayama. There are many deals that you can choose. You maybe confused and overwhelmed to pick up. In this post, I would like to show you all available deals and help you to find the best deal for you. If you have plan to stay in Osaka for entire stay and make day trips to other places from Osaka, the following post may help you to build your itinerary. How to build the itinerary and choose the deals for Osaka stay 5 to 7 days. Posted on October 23, 2014 February 19, 2017 Categories 4 to 6 days, 7 to 9 days, Osaka, Kyoto, Kobe and NaraTags Haruka, JR West Kansai Area Pass, KIX, Kansai, Kansai Airport Rapid Service, Namba, Osaka, Shin-Osaka, Tennoji, Umeda287 Comments on How to build the itinerary and choose the deals for Osaka stay 5 to 7 days. I think many travellers prefer to stay in one place and visit surrounding areas as day trip. I have received many inquiries about Osaka stay and visit surrounding areas, like Kyoto, Kobe, Nara as day trip. I understand that it’s quite easy to stay in one place and enjoy the trip with luggage free. But many of you struggle to plan and choose the deals. In this post, I show you 5 days Osaka stay sample itinerary. You will learn how to choose the deals for your trip. Of course you can extend to stay, like 6 days, 7 days, as many as you want. Continue reading How to build the itinerary and choose the deals for Osaka stay 5 to 7 days. Alternatives of Overnight train Twilight Express, in case that you cannot make a reservation. Posted on June 17, 2014 March 14, 2015 Categories Overnight Trains, Sapporo, New Chitose Airport, Hakodate, Shin-Hakodate-Hokuto, Aomori, Shin-Aomori, Hirosaki, Osaka, Shin-Osaka, Namba, TennojiTags Hakucho, Hamanasu, Hayabusa, Hayate, Hikari, Hokuto, New chitose airport, Osaka, Sapporo, Shin Aomori, Shin-Osaka14 Comments on Alternatives of Overnight train Twilight Express, in case that you cannot make a reservation. Twilight Express is very popular. Many tourists might think about taking this luxury overnight train. But you have a problem. Twilight Express cannot be reserved online. The only way to reserve it from outside of Japan is calling Odekake net 078-341-7903 in Japanese and you have to pick up your ticket in JR West, Shikoku or Kyushu stations. You cannot pick up it in other areas, like Tokyo. Otherwise You need to go to a reservation window at the station in Japan. Ticket is started to sell one month prior to the departure date. That means it may be sold out when you arrive in Japan. So you need to think about alternatives if you have a plan to take this train. I tell you several options for the case that you cannot make Twilight Express. Twilight Express departs from Osaka at 11:50am and arrive in Sapporo at 09:52am, and depart from Sappro at 12:52pm and arrive in Osaka at 14:05pm. I try to make an alternatives as same schedule as possible. Continue reading Alternatives of Overnight train Twilight Express, in case that you cannot make a reservation. Sanyo Shinkansen image gallery. Check the interior and accommodations. Posted on May 1, 2014 August 14, 2014 Categories Tokaido, Sanyo and Kyushu, Osaka, Shin-Osaka, Namba, Tennoji, Kobe, Himeji, Hiroshima, Miyajima, Okayama, Hakata, KokuraTags Hakata, Hikari, Hiroshima, Kodama, Mizuho, Nozomi, Sakura, Shin-Osaka, okayama7 Comments on Sanyo Shinkansen image gallery. Check the interior and accommodations. Sanyo Shinkansen is operated between Shin-Osaka and Hakata. But Sanyo Shinkansen is connected with Tokaido Shinkansen (from Nagoya, Kyoto and Tokyo) at Shin-Osaka and Kyushu Shinkansen (from Kumamoto and Kagoshima) at Hakata. Most of trains run from Tokyo (Nozomi and Hikari) are operated by Tokaido Shinkansen fleet, 700 series or N700 series. If you look for the images of these trains, please see Tokaido Shinkansen image gallery. Most of trains to Kyushu, such as Kumamoto or Kagoshima-chuo (Mizuho and Sakura) are operated by Kyushu Shinkansen fleet, N700 series. If you look for the image of this train, please see N700 series for Kyushu Shinkansen Mizuho and Sakura. In this post, I show you the images of 700 series and 500 series. These train sets are used as “Kodama” (stops at all stations) of Sanyo Shinkansen. And you can find 800 series of Kyushu Shinkansen segment (Hakata – Kagoshima-Chuo) at Kyushu Shinkansen. *Sonic Rail Garden has copyright for all images below. Continue reading Sanyo Shinkansen image gallery. Check the interior and accommodations. Shirahama is located at the west coast of Kii peninsula, Wakayama prefecture. You can get there by Limited Express Kuroshio from Shin-Osaka and Tennoji directly. There are some marine attractions, such as glass boat and popular theme park, Adventure World. If you travel with your kids, this spot is considerable. Because I had a trip with my 4 years old daughter and she was so happy. What is the Shinkansen (bullet train)? Most convenient and the fastest train service throughout Japan. Posted on January 8, 2014 January 3, 2019 Categories Tokaido, Sanyo and Kyushu, Tohoku, Hokkaido,Akita and Yamagata, Joetsu, Nagano and Hokuriku, Network of JR trainsTags Akita, Bullet Train, Fukushima, Hakata, Kyoto, Nagoya, Osaka, Shin Aomori, Shin-Osaka, Shinjo, Shinkansen, Super Express, Tokyo, Toyohashi, Yamagata, hachinohe, kagoshima-chuo, kumamoto, nagano, niigata47 Comments on What is the Shinkansen (bullet train)? Most convenient and the fastest train service throughout Japan. 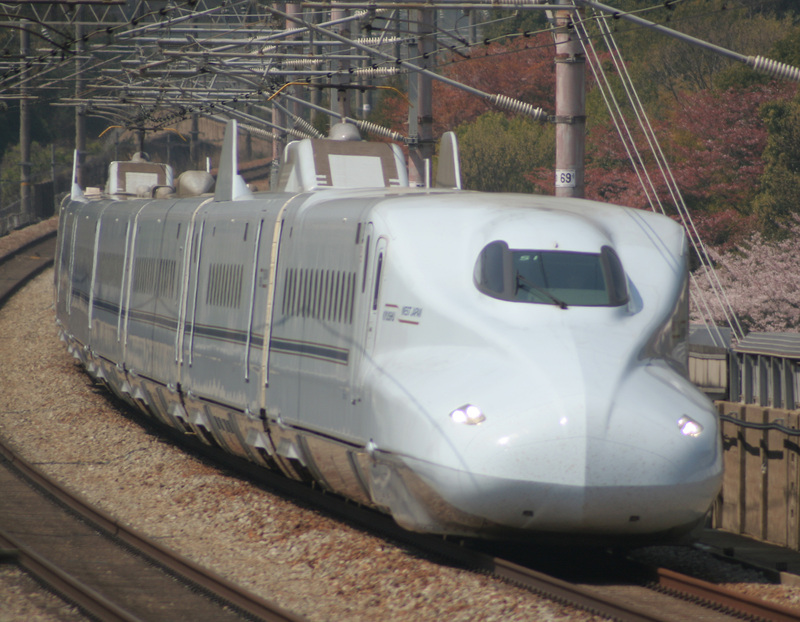 The Shinkansen (新幹線) is a high speed train service that is operated by JR. It is one of the fastest trains in world and sometimes called “Bullet Train”. JR has this high speed train network throughout Japan. You can save lots of your trip time by using this train system. I would like to share a basic information about the Shinkansen train system. Continue reading What is the Shinkansen (bullet train)? Most convenient and the fastest train service throughout Japan. Ise access guide. Kintetsu is the best way but we can use JR Pass too. Posted on June 1, 2013 Categories Chubu Area, Kansai AreaTags Ise, Ise-shi, Kashikojima, Kintetsu, Kyoto, Nagoya, Namba, Shin-Osaka, Toba, Tsuruhashi, Uehonmachi, Yamato-Yagi22 Comments on Ise access guide. Kintetsu is the best way but we can use JR Pass too. This building is Naiku Kaguraden. It is one of the buildings in one of two shrines, Naiku and Gaiku. Ise is well known as home of Ise Grand Shrine (Ise Jingu). This is one of the most sacred and most famous Shinto shrine throughout Japan. And most part of Ise area is located in Ise-Shima National Park. There are lots of beautiful scenery and you can enjoy many kinds of fresh seafood. If you are family traveller, there are aquarium in Toba area and Shima Spanish village theme park in Shima area. There are many kinds of attraction for all types of travellers. Ise, Toba and Shima areas are very accessible by Kintetsu Railway’s train. Most of domestic travellers use this train. But if you are Japan Rail Pass user, you can use the pass with small restriction. I tell you about access to this area by both Kintetsu trains and JR trains. Continue reading Ise access guide. Kintetsu is the best way but we can use JR Pass too. ICOCA and Haruka, Kansai One Pass and Haruka, and Haruka discount ticket. Very flexible and good deal for tourist who stay in Kansai. Posted on May 27, 2013 March 12, 2019 Categories Osaka, Kyoto, Kobe and Nara, Rail pass for visitorsTags Hanshin, Haruka, ICOCA, Kintetsu, Kyoto, Midousuji line, Namba, Osaka Subway, Sannomiya, Shin-Osaka, Umeda1,145 Comments on ICOCA and Haruka, Kansai One Pass and Haruka, and Haruka discount ticket. Very flexible and good deal for tourist who stay in Kansai. You may travel in Kansai area only and not travel throughout Japan. You may have one way trip from Osaka to Tokyo. For these travelers, ICOCA and Haruka gives you a good deal for Kansai airport to Osaka, Kyoto and Nara. This deal gives you access to Osaka and Kyoto by Limited Express Haruka and 1500 yen preloaded e-money in ICOCA card. I will tell you what this deal is and how to use it. Continue reading ICOCA and Haruka, Kansai One Pass and Haruka, and Haruka discount ticket. Very flexible and good deal for tourist who stay in Kansai. Limited Express Super Hakuto (スーパーはくと) connects Kyoto (京都), Shin-Osaka (新大阪), Osaka (大阪), Sannomiya (三ノ宮) and Himeji (姫路) with Tottori (鳥取) and Kurayoshi (倉吉). This it the fastest and most frequent direct train service to Tottori from Osaka, Kobe and Kyoto. But this train goes through non JR line, Chizu Kyuko Railway. That means you need to pay extra if you use this train by Japan Rail Pass. If you don’t want to pay extra, Limited Express Hamakaze is available between Osaka and Tottori. However there is only one round trip and travel time is 1.5 hours longer than Super Hakuto. Posted on October 19, 2012 April 22, 2017 Categories Osaka, Kyoto, Kobe and Nara, Rail pass for visitorsTags Haruka, Himeji, JR West, Kansai, Kansai Airport Rapid Service, Kansai Area Pass, Kansai Thru Pass, Kobe, Kyoto, Namba, Nara, Osaka, Sannomiya, Shin-Osaka, Special Rapid Service, Umeda649 Comments on How to use JR West Kansai Area Pass. Compare pass and single fare. Limited Express Haruka from KIX is covered by this pass. The post, How to choose discount railway ticket and pass in Kansai (Kyoto, Osaka, Kobe, Nara) area is one of most popular one in this site. Since I published this post, I have received many comments and questions. I have written about Kansai Thru Pass in the previous post. This pass covers most of private railway companies, subway trains and some bus services. It may give you the great value if you use it. But JR West Kansai Area Pass is more suitable for some travellers. Especially if you go to Kyoto or Shin-Osaka from Kansai Airport, this pass gives you very good deal. In this post, I would like to share the information about JR West Kansai Area Pass with you. And I will compare the price of pass and single fare. Continue reading How to use JR West Kansai Area Pass. Compare pass and single fare. Shin-Osaka station is the place where you change to/from Shinkansen. If you travel in Osaka, you may use this station at least once. All Shikansen trains stop at this station and many limited express trains on conventional lines stop or depart from this station, Shin-Osaka. N700 series was introduced for Kyushu Shinkansen in this past March. The fleet is the newest and the fastest on Kyushu and Sanyo Shinkansen. If you will use Japan Rail Pass, you may take this train as Sakura from Shin-Osaka to Hakata, Kumamoto or Kagoshima-Chuo. Konotori connects Shin-Osaka (新大阪) and Osaka (大阪) with Kinosaki-Onsen (城崎温泉), Toyooka (豊岡) and Fukuchiyama (福知山). When you go to the popular hot springs town, Kinosaki or one of “Three Views of Japan”, Amanohashidate from Osaka, you may take this train. JR Limited Express Haruka is one of the popular way from KIX to get Osaka. Limited Express Haruka connects Kansai airport and Kyoto via Tennoji and Shin-Osaka. Kansai Airport Limited Express Haruka may be your first train in Japan. It is operated between Kansai (Osaka) airport and Greater Osaka area, Kyoto, Kusatsu and Maibara. But please be careful that Haruka does not stop at Osaka station. It stop at Tennoji and Shin-Osaka. If you want to go to Osaka station, you have to transfer to the local train at Shin-Osaka. This express train has 30 round trips a day and are operated mostly every 30 minutes. Nankai Railway will suspend Cable Car operation between Gokurakubashi and Koyasan from November 26, 2018 to February 28, 2019 because of replacement of new cable car fleet. You have to take a bus from Hashimoto to Koyasan in this period. Please find the detailed information in Nankai Railway official site. Mt. Koya (Koyasan) is one of very popular destinations in Kansai area. Most common way to Mt. Koya is Nankai Railway line. It takes you to Gokurakubashi station where is located at the base of Mt. Koya. You may transfer to the funicular to Mt. Koya. If you use JR deals, such as JR Pass (nationwide pass), Kansai area pass, Kansai Hiroshima area pass and other JR West passes, you cannot use the pass because Nankai Railway is not JR. If you do not use these JR deals, you may use other deals, such as Kansai Thru Pass, Koyasan World Heritage Pass. You may use these JR deals partially to get Mt. Koya if you want. In this post, I would like to show you the way to get Mt. Koya and also tell you how you use the deal. I have received the email from JR West. They confirmed Japan Rail Pass can be used for Kyushu Shinkansen. But Japan Rail Pass can be used for only Sakura that is the second fastest train between Shin-Osaka and Kagoshima-Chuo. We cannot take Mizuho that is the fastest train between Shin-Osaka and Kagoshima-Chuo by Japan Rail Pass. JR West and Kyushu applied same fare table as Nozomi. So Japan Rail Pass does not cover even the basic fare. If you take Mizuho, you have to pay the full fare. Of course we take Tsubame that is operated between Hakata and Kagoshima-Chuo. If you cannot take Sakura, you can take Hikari or Kodama to Hakata, then transfer to Tsubame.